Using Conductivity To Determine The Location Of Moisture In A Masonry Arch Bridge. This paper investigates the use of electrical conductivity measurements for determination of moisture behind the surface of masonry arch bridges. 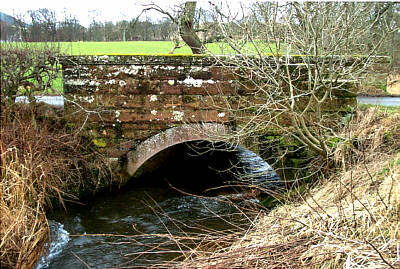 The paper will describe both laboratory experiments and a case study of a masonry arch bridge in Scotland. The laboratory results demonstrate the repeatability of the method. The laboratory and field work show that electrical conductivity measurements can be used to determine the presence of moisture within the fill of a masonry arch bridge. This work formed a part of a project sponsored by the Highways Agency at Edinburgh University to provide advice on the use of conductivity measurements for obtaining information on the condition of highway structures. Stone masonry arch bridges form a critical part of the transportation system in Britain, since they comprise over 40 per cent of the bridge stock in current use (Page,1989). In total, there are over 40,000 arch highway bridges and 33,000 railway arch spans in the UK (Mair,1994). Many road bridges were originally designed for horse drawn traffic and although they are carrying loads greatly in excess of those for which they were designed, they are showing little sign of distress. However, within the European Union a special problem arises with respect to masonry arch bridges due to the increasing axle loads dictated by EU policies. Implementation of these policies in the UK means that 40 tonne vehicles have operated on the highways since January 1999 and over 100,000 small span highway bridges will have to be potentially assessed. The increased traffic loading since the original design and construction of many of these bridges is one of the main causes of concern. together with material deterioration and the development of structural faults resulting from inadequate specification of the construction method and the materials used. The assessment and maintenance of the structures is a difficult and expensive task, especially while the bridge is in service. Historic structures, such as masonry arch bridges rarely have accurate or perhaps any drawings of their construction. Considerable problems occur when it becomes necessary to assess the structural stability of a critical component of a complex structure. Hence it is essential that some knowledge of the internal structure of a bridge is obtained before any remedial work or strengthening can be carried out. In this respect non-destructive testing (NDT) methods can play an important role both in the inspection process and at a later date when the outcome of the strengthening process has to be checked (Colla et al,1995; Colla et al,1996). The electrical conductivity method (Colla et al,1997) enables low cost scans to be made of the sub-surface conductivity of the bridge fabric with a nominal penetration of either 1.5 m or up to 4 m where large surface areas are available. This NDT method requires no contact with the surface of the structure and is non-invasive. An advantage of the method is that it is normal procedure in standard geophysical surveys carried out in engineering site investigations to use an electrical conductivity meter before a GPR survey is undertaken. The results from the conductivity survey can often indicate whether the GPR survey is likely to achieve the required penetration into the ground since the attenuation of the electromagnetic pulse is significantly increased in a high conductivity environment. The electrical conductivity of a masonry structure is a function of the degree of the water saturation of the materials within it and their electrical properties (Culley et al, 1975). Electromagnetic fields are propagated into the structure and variations are monitored and recorded. These provide geometrical and electrical information on the materials investigated and their degree of saturation. Details regarding the principles involved, the apparatus, the method of test, the method of calculation and the contents of the test report are provided in this paper. Water ingress and moisture movement into structures is important in terms of structural durability. For example, if the road surface of a brick masonry arch bridge permits water entry then the soil fill above the arch barrel may become saturated (Colla et al, 1995a). This can result in degradation of the mortar between the bricks - giving rise to premature failure. Another example of water inclusion in masonry structures is due to moisture capillary rise from the foundations. The Architect or Engineer may want to know what is the actual height of water rise in the inside of the wall - this height is generally greater than what it shows on the external wall surface (Binda et al,1994). In the majority of the cases, salt content is associated with water content in the structure. This phenomenon can also cause great damage to the structure and rapid decay of the masonry wall, and it is therefore a cause of concern. Thus a non-invasive method of determining moisture movement behind or inside the masonry walls would be of great engineering value. The application of this electromagnetic technique for measuring conductivity involves the use of a transmitter coil energised with an alternating current and a receiver coil located a short distance away. The time-varying magnetic field arising from the alternating current induces very small currents in the structure. These currents generate a secondary magnetic field, which is sensed, together with the primary field, by the receiver coil. The conductivity equipment permits the measurement of near surface average conductivity. It should be noted that the results are averaged over the depth of penetration. This secondary field is a function of the inter-coil spacing, the operating frequency and the conductivity of the materials, and reveals the presence of a conductor and provides information on its geometry and electrical properties (McNeil, 1980a, 1980b). The induction of current flow results from the magnetic components of the EM field, consequently there is no need for physical contact with the surface of the structure investigated. A widely used commercially available conductivity meter is the Geonics EM 38 - Figure 1. Fig 1: Showing the Vertical and Horizontal orientation. Typical values of conductivity for geological and building materials are given in Table 1. Table 1: Typical values of conductivity for geological and building materials. Tests should be conducted under ambient conditions, however the work should not be carried out in heavy rain or other such adverse conditions since these will cause severe erroneous results. Heavy water ingress will significantly affect the results of a conductivity survey. Values of conductivities are usually recorded when direct current is employed for the measurements but it must be noted that the electrical properties of the sample may vary with the instrumentation frequency (Keller and Frischknecht,1966; Olhoeft, 1975; Olhoeft, 1977; Telford et al,1976). Most soil and rock minerals forming building materials are insulators and conduction through the rock matrix only takes place when certain clay materials, native metals and graphite are present (Heiland, 1968; Stewart et al, 1994). The minerals in the sand and silt fractions of the soil are electrically neutral and are generally excellent insulators. The electrical conductivity of the material is thus primarily controlled by the particle size, the amount of water present in the pores and by the conductivity of the pore fluid. The general trend is that conductivity will increase with reducing particle size, increasing moisture content and increasing salt content. Measurements made on material as a function of the moisture content by weight, show a conductivity that increases approximately as the square of the moisture content (Smith-Rose, 1934). The solutions of salts in pore water will substantially increase the material conductivity (Colla, 1997; McNeil, 1980a). The temperature dependence of the electrical conductivity of the electrolyte is almost entirely due to the temperature dependence of the viscosity of the liquid and a change in conductivity of 2.2 % per degree may be expected. This phenomenon implies that for high seasonal changes of temperature, the conductivity over the normal range of ambient temperature may double. Unconsolidated materials at ambient temperatures usually display a range of conductivity between 1 and 1000 mS/m, whilst the conductivity of rocks lies between 0.01 mS/m and 100-200 mS/m. The conductivity of masonry structures and walls made up of natural building materials can be expected to be in a range between 0 and 150 mS/m. Measuring the conductivity of water provides a valuable information when a GPR radar survey is to be carried out over fresh or polluted water for bottom and sub-bottom investigation. The value will give an indication of the radar signal penetration (Davidson and Forde, 1996; Sellmann et al, 1993). Other examples of applications of conductivity measurements include monitoring concrete curing (Tamas, 1982). Table 1 gives a broad indication of the conductivity of geological and building materials but extreme caution must be exercised in employing these values for anything than a rough guide. A transmitter coil Tx energised with an alternating current at an audio frequency is placed on the material or structure surface and a receiver coil Rx is located a short distance s away. The magnetic field arising from the alternating current in the transmitting coil induces very small currents in the structure material. These currents generate a secondary magnetic field H that is sensed, together with the primary magnetic field Hp, by the receiver coil - Figure 2. The response fields differ both in phase and amplitude from the transmitted ones, and these differences reveal the presence of the conductor and provide information on its geometry and electrical properties. Fig 2: Induced current flow in a homogeneous half-space with coils working in a vertical dipole mode (Colla, 1997). In general this secondary magnetic field is a function of the intercoil spacing s, the operating frequency f and the conductivity s. The ratio of the secondary to the primary magnetic field is therefore linearly proportional to the material conductivity. Given a frequency and an intercoil spacing, a maximum depth of penetration can be reached. For example, at a frequency of 14.6 kHz and intercoil spacing of 1 metre, a maximum depth of penetration of 1.5 m can be reached. This depth of exploration is generally considered suitable for masonry structure investigation, including historical ones. The Geonics EM 38 (Figure. 1 & 2) is one of such instruments commercially available but, provided that the operating frequency and inter-coil spacing are similar to the figures previously quoted, any other conductivity metre could be used. The lower the frequency, the deeper the penetration but the poorer the resolution - as amplitude decreases exponentially with depth (Kearey and Brooks, 1991; Milson, 1989; McNeil, 1980b). The value of conductivity read on the instrument does not represent the conductivity at any particular depth, rather the value is a function of all the material between the face of the instrument and the maximum depth of exploration. The instrument can be rolled over, Figure 1, so that the vertical dipole transmitter/receiver geometry becomes a horizontal dipole transmitter/receiver geometry. This feature is useful in diagnosing and defining a layered media. Changing the conductivity of any one of the layers of a horizontally stratified structure, such as a multi-wythe masonry wall or masonry arch bridge abutments, spandrel and wing walls, will not alter the geometry of the current flow. Varying the conductivity of any layer will proportionally vary only the magnitude of the current in that layer. To calculate the resultant magnetic field at the surface it is simply necessary to calculate the independent contribution from each layer, which is a function of its depth and conductivity, and to sum all the contributions. The technique allows this calculation due to its non-contacting characteristic mode of operation. Consequently, the instrument can be lifted off the surface of the structure and readings can be taken at increasing distances from the wall surface. 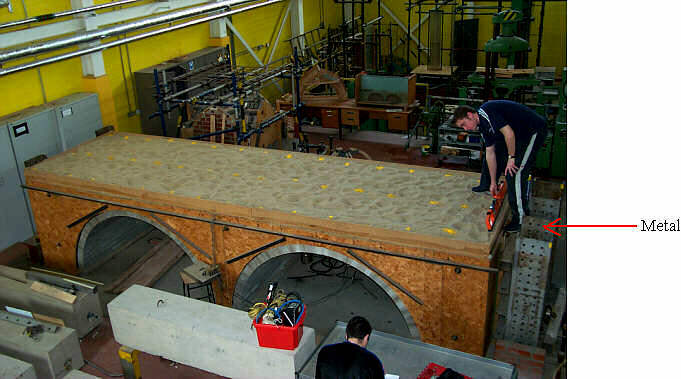 The mock bridge was located in the University of Edinburgh's Civil Engineering Structures laboratory. The bridge has been constructed with the same salient dimensions as the structure shown in Figure 3. The arch barrels are each formed of a single ring of 41 class B engineering bricks set on their sides to a total thickness of 102.5 mm, with a nominal 10 mm mortar bond. The barrel was in English bond with half brick cut every second course for the facing of the arch ring. A standard mortar mix of 1:1:6, cement : lime : sand were used with Ferocrete quick drying cement. Fig 3: Schematic diagram of salient dimensions. Table 2: Fill material Properties. The fill is sharp sand. The fill material used has been characterized for previous experiments by Fairfield (1994) and Prentice (1996), the measured in situ density and shearing resistance are shown in table 1. The difference between the shear resistance angles seems large but has been explained (Prentice (1996)). Fig 4: The masonry arch tank empty. Fig 5: Masonry arch tank full of sand. Figure 4 shows the masonry arch bridge tank empty. While Figure 5 shows the tank full of sand. The bridge when constructed was reinforced using metal ties. These can be seen in Figure 4 and the external position can be seen in Figure 5. The bridge was tested when the fill was dry, had 12.5 litres of water poured over the centre of 1 arch, 62.5 litres poured over the same centre, and finally 312.5 litres eventually distributed over the same arch. A conductivity survey was conducted over the surface of the masonry arch tank. The survey was undertaken at ground level and 1.5 m above the surface, the survey was conducted in both horizontally and vertical orientations. The conductivity survey was undertaken when the tank was dry and as different amounts of water were introduced. The disadvantage of conducting a conductivity survey of the masonry arch tank is the presence of metal. There is a large amount of metal with the tank and surrounding the tank, as can be seen in Figure 5. This metal cannot be taken away as it holds the tank together. Figure 5 also shows the conductivity survey taking place. The results from the conductivity survey can be seen in Figure 6 and Figure 7. 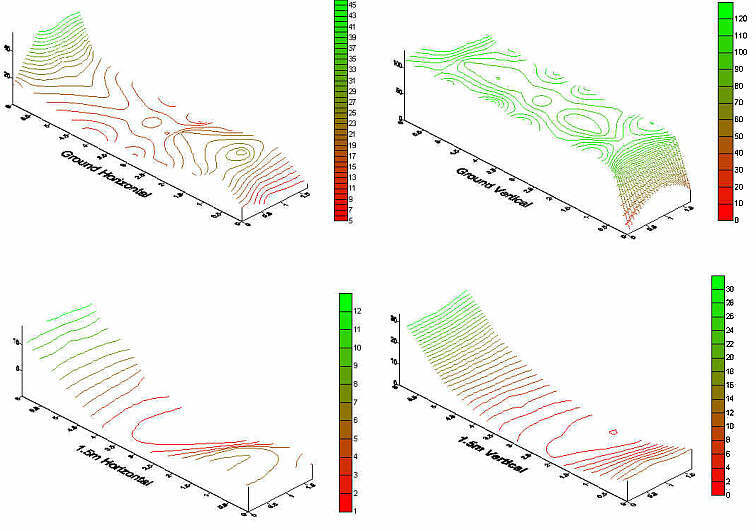 In these conductivity plots all 4 recorded modes are shown. 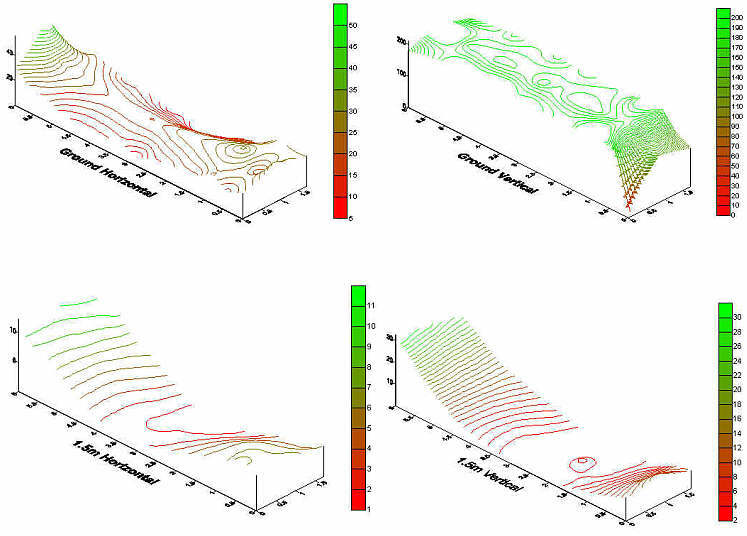 The data was plotted using the plotting software Surfer, this gives a 3-D contour plot of the conductivity. The scale used shows the highest conductivity in each plot to be green while the lowest to be red, the scale used is shown on the side of each of the plots. Figure 6 shows the results from the dry tank. Figure 7 shows the results when 312.5 litres of water where poured over the first arch. There is a clear difference between the two conductivity plots, showing that conductivity can tell the difference between wet and dry fill. The differences are not very clearly shown in these figures due to the excessive amount of metal surrounding the tank, so Figure 8 shows the relative difference between the two surveys (i.e. the dry survey subtracted from the wet survey). In Figure 8 it can be seen that over the second arch there is no difference in conductivity between the two surveys. Fig 6: Conductivity Survey of the Dry Tank. Fig 7: Conductivity Survey of the Tank after 312.5 litres of Water. Fig 8: Comparative differences between Figure 6 and Figure 7 (Relative difference of the water). Kilbucho bridge is a single span low rise skew brick arch with stone walls that span the Kilbucho Burn and gives access the local farms. Its overall width is 5.1 m and the arch spans 3.6 m with a rise ratio of 3. The stone parapets are 1.1 m high and 0.3 m thick. The skew of the bridge is 20°. The multi-ring brick arch barrel is 0.36m thick, and the fill is 0.3 m thick at the crown. The bridge is located one mile from Kilbucho on the C road that connects Broughton and Biggar skirting to the North side of Goseland Hill and is approximately 33miles south west of Edinburgh. Figure 9 shows the east side of the bridge. The local land around the bridge is prone to localised flooding and the bridge can sometime be submerged in water. A Geonics EM-38 was used to survey Kilbucho bridge. As the history and construction was known at the time of the survey the absence of metal in the bridge was known, so only a quad-phase survey was undertaken. The EM-38 is shown in Figure 1 the coil separation is 1m, resulting in a penetration of 1.5m. Both vertical and horizontal orientation was used to survey the bridge at two different heights 1.5m above the road surface and coupled to the road. The two different orientations give different penetrations into the bridge, in the vertical orientation it penetrates to the full 1.5m, while in the horizontal orientation a reduced penetration is obtained. As with all electromagnetic instrumentation the EM-38 had to be zeroed. This was completed according to the manufacturer's instructions, over a non- conductive medium, i.e. away from all buried pipes, overhead wires and water. Fig 9: East side of the Kilbucho bridge. Fig 10: Results of the conductivity survey. 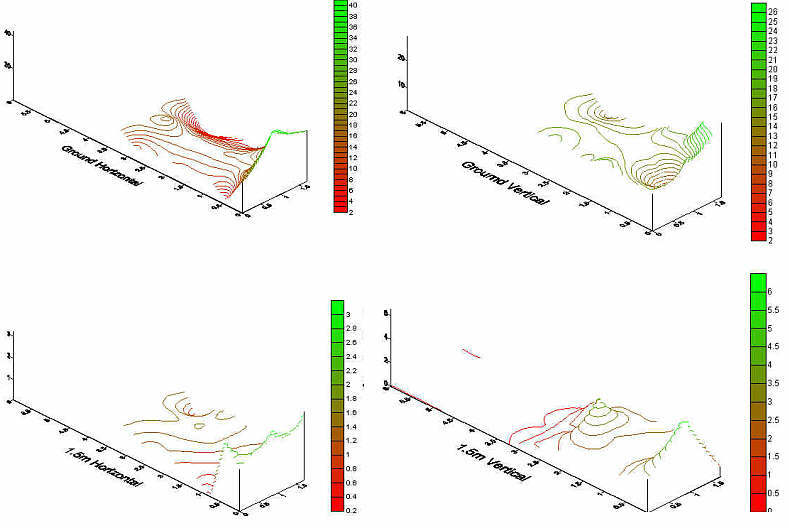 From Figure 10 the four different types of the conductivity survey are seen. Greatest penetration is in the survey conducted in the vertical orientation coupled to the ground; this survey is probably only measuring the conductivity at the level of the river. The surveys conducted 1.5m above the ground are measuring the conductivity of the surface and the first few centimeters of the bridge. In this case the most revealing surveys conducted are the ones conducted coupled to the surface. The horizontal orientation at this level is measuring the conductivity of the fill in the bridge. It can be seen that from the two surveys conducted at the ground level the fill has a very high conductivity. This is indicative of a high moisture content or a high mineral content, due to the site location the soil and ground conditions surroundings the bridge it is presumed that the fill of the bridge has a high moisture content. If the moisture had contained salts or high mineral concentration the recorded conductivity would be expected to be higher. 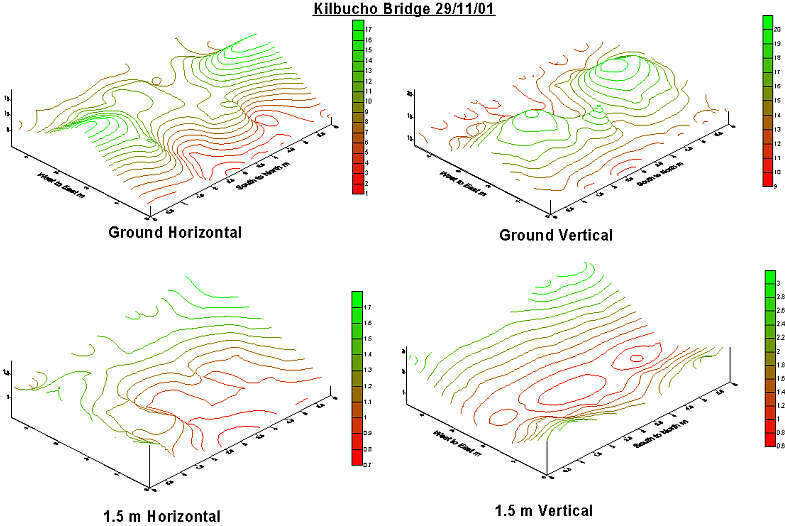 The vertical orientation of the survey conducted at 1.5m above the road surface shows two higher areas of conductivity at either side of the bridge, these relate to the position of the abutments. This measurement of the conductivity of the stone abutments shows that the conductivity anomalies seen in the surveys conducted coupled to the ground would be due to moisture not just the stone arch itself. The horizontal orientation at 1.5 m above the ground is only measuring the residue/background conductivity due to the orientation, height above the ground and the highest recorded value was 1.7 mS/m (a very low value). It can be seen that the conductivity of the fill is higher than that of the road at both ends of the bridge. This suggests that the fill material is poorly drained and the moisture within it is not able to drain away. The recorded conductivity values were slightly higher in the vertical orientation than in the horizontal orientation. The author wish to thanks the Highways Agency for their funding. Conductivity has proven both in the field and in the laboratory to be a successful tool to identify the location of moisture within the fill of a masonry arch bridge. The low cost, in terms of time in the data collection phase and post data-collection analysis, makes conductivity surveying convenient for repetitive surveys. The technique allows for high resolution in the conductivity variations detected, thereby improving the quality of the results interpretation. Conductivity is usually determined by one or more of the following parameters: clay content, moisture content, moisture salinity, temperature - the most complex is usually the moisture profile which is affected by the material type and its compaction/porosity, and seasonal variations. The technique allows for lateral variations of conductivity to be measured accurately. Simple multi-layered conductivity surveys are also possible by raising the instrument above the material/ structure surface. The values of conductivity, directly read on the instrument, are a function of the frequency used and coil spacing - the figures do not represent the conductivity at any particular depth, rather the value is a function of all the matter between the face of the instrument and the maximum depth of exploration. Binda, L., Colla, C. & Forde, M.C. "Identification of moisture capillarity in masonry using digital impulse radar", J. Construction & Building Materials, 1994, 8, No. 2, 101-107. 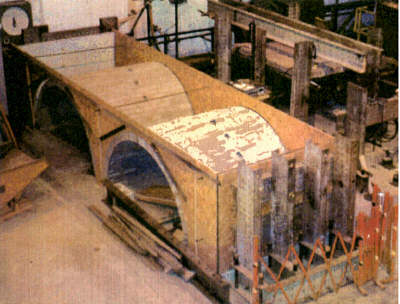 Colla, C, Forde, M.C., McCann, D.M., & Das, P.C (1995) Investigation of masonry arch bridges using non-contacting NDT, Proc. 6th Int. Conf. Structural Faults & Repair-95, London, July 1995, Vol. 1, Engineering Technics Press, 235-239. Colla, C., (1997), NDT of masonry arch bridges, PhD Thesis, The University of Edinburgh, Dept. Civil and Environmental Engineering, Edinburgh, 242 pp. Colla, C., Das, P.C., McCann, D.M. & Forde, M.C. (1995) Investigation of stone masonry bridges using sonics, electromagnetics & impulse radar, Proc. Int. Symp.Non-Destructive Testing in Civil Engineering (NDT-CE), BAM, Berlin, Germany, September 1995, Vol. 1, 629-636. Colla, C., McCann, D., Das, P., Forde, M.C., (1997), Investigation of a stone masonry bridge using electromagnetics,Evaluation and strengthening of existing masonry structures, (Binda, L., Modena, C., eds. ), RILEM, p.163-172. Colla, C., McCann, D.C., Das, P.G., Forde, M.C., (1996), Non contact NDE of masonry structures and bridges, Proc. 3rd Nondestructive Evaluation of Civil Structures and Materials, Boulder, Colorado, USA. Culley, R.W., Jagodits, F.L., Middleton, R.S., (1975), E-phase system for detection of buried granular deposits, Symposium on Modern Innovations in Subsurface Explorations, 54thAnnual Meeting of Transportation Research Board. Davidson, N.C., Forde, M.C., (1996), "A laboratory appraisal of ground-penetrating radar over water", Nondestructive Testing and Evaluation, 12(4): 219-242. Fairfield, C.A., 1994, Soil-structure interaction in arch bridges, PhD Thesis, University of Edinburgh. Heiland, C.A., (1968), Geophysical exploration, New York, Hafner Publishing Co.
Kearey, P., Brooks, M., (1991), An Introduction to Geophysical Exploration, Oxford. Keller, G.V., Frischknecht, F.C., (1966), Electrical methods in geophysical prospecting, Ch. 1. Pergamon Press, N.Y.
Mair, A. J., (1994) A new UK design standard for unreinforced arch bridges, Unpublished Report, 10p. McNeill, J.D., (1980), Electrical conductivity of soils and rocks, Ontario, Geonics Limited, Technical Note TN-5, 22 pp. McNeill, J.D., (1980), Electromagnetic terrain conductivity measurement at low induction numbers, Ontario, Geonics Limited, Technical Note TN-6, 15 pp. Milsom, J., (1989), Field Geophysics, Geological Society of London Handbook, 182 p.
Olhoeft, G.R., (1975), Electrical properties of rocks, The physics and chemistry of rocks and minerals, J.Wiley and Sons, N.Y., p. 261-278. Olhoeft, G.R., (1977), Electrical properties of natural clay permafrost, Can J. Earth Science, vol. 15, p. 16-24. Prentcie, D.J., 1996, An appraisal of the Geotechnical Aspects of Multi-span Arch Bridges, PhD Thesis, University of Edinburgh. Sellmann, P.V., Delaney, A.J., Arcone, S.A., (1993), Observations of radar performance for bottom and sub-bottom information in fresh water, Proc. 2nd Government Workshop on GPR, Advanced Ground-Penetrating Radar: Technologies and Applications, Ohio State University, 26-28 Oct., p.59-70. Smith-Rose, R.L., (1934), "Electrical measurements on soil with alternating currents", Proc. IEE 75: 221-237. Stewart, R.D., Anderson, W.L., Grover, T.P., Labson, V.F., (1994). "Shallow subsurface mapping by electromagnetic sounding in the 300 kHz to 30 MHz range: model studies and phototype system assessment", Geophysics 59, (8): 1201-1210. Tamas, F., (1982), Electrical conductivity of cement pastes, Cement and Concrete Research, 12: 115-120. Telford, W.M., Geldart, L.P., Sheriff, R.E., Keys, D.A., (1976), Applied Geophysics,Ch. 5, Cambridge University Press, N.Y.